Over 75% of people in The Arc’s residential program have no active family or other supports in their lives. At Christmas, the community comes together to become that family and provide Arc residents with the joy of Christmas. In 2018, over 350 donors gave almost $32,000 in gifts that put a smile on the face of 300 residents. Gifts range from every day necessities like clothing and personal care items, to fun wish-list gifts like music, movies, crafts, room decor, and more. 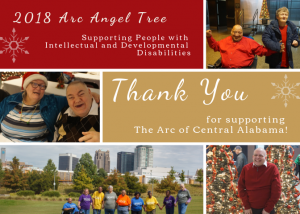 Thank you from the bottom of our hearts to every generous donor who makes The Arc Angel Tree program possible. For more information on this program at any time of year, please email development@arcofcentralalabama.org.